Closing out a 166-day stay in orbit, two cosmonauts and a NASA astronaut strapped into a Russian Soyuz spacecraft Tuesday, undocked from the International Space Station and fell back to Earth, settling to a jarring rocket-assisted touchdown on the steppe of Kazakhstan. Suspended below a large red and white-striped parachute, the Soyuz TMA-08M descent module completed the final stages of the flight within easy view of Russian recovery forces and long-range tracking cameras, setting down at 10:58 p.m. EDT (GMT-4; 8:58 a.m. Wednesday local time) and rolling over on its side. Recovery crews and flight surgeons quickly rushed to the scorched descent module to help commander Pavel Vinogradov, flight engineer Alexander Misurkin and NASA SEAL-turned-astronaut Christopher Cassidy out of the cramped spacecraft, carrying them to nearby recliners. 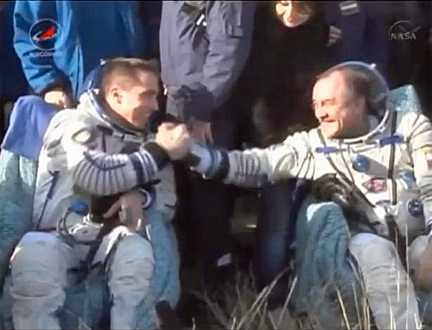 All three appeared relaxed and in good spirits, resting comfortably and chatting with support crews. At one point, Vinogradov, smiling broadly, reached over to Cassidy for a hearty handshake. After initial medical checks and satellite phone calls to family and friends, the station fliers were carried into a nearby medical tent for more extensive checks as they begin readjusting to gravity after five-and-a-half months in the weightless environment of space. 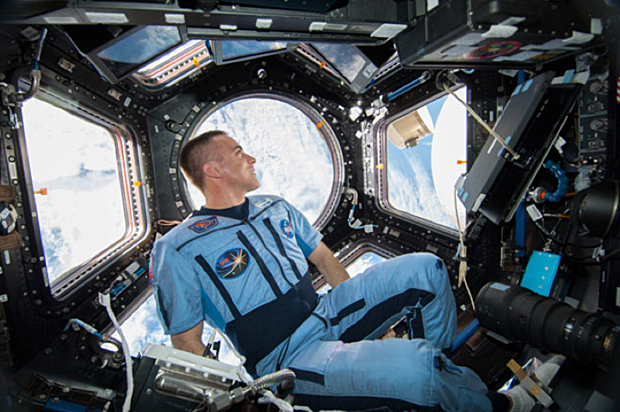 Cassidy planned to participate in a new project to help researchers get a better idea of how long-duration spaceflight might affect astronauts on eventual flights to Mars. "This will be the first opportunity where we ask the crew members post landing to do some exercises," said Mike Suffredini, space station program manager at the Johnson Space Center in Houston. The idea is to get a better idea of what hurdles a Mars crew might face after a year-long flight without a medical team standing by to help out. "And the question is, what is their condition, what can we expect them to do?" Suffredini said. "And it will kind of lead our thinking on how the first few days of any exploration mission would take place to make sure the crew doesn't hurt themselves in the process of landing and getting themselves ready to operate on the surface of a foreign planet." As a former Navy SEAL and veteran of a 2009 shuttle flight, Cassidy is more familiar than most with physical fitness. But he said he expects vestibular difficulty -- poor balance and coordination -- to be more of an issue than physical strength. "At face value, the tasks that I'll be doing are not super complicated," he told CBS Radio last week. "From sitting in a chair, standing up, from lying down flat to standing up and some small jumps, I think, just a few basic things I did pre-flight. They have video of how my body reacts to those things when I'm normally adjusted to one G, and I'll do those again very soon after landing in the medical tent. "I'm really curious about how it will go," he said. "I remember how I felt after my shuttle landing and I think I could have done those. I would have been wobbly, but I would have been able to do those tasks. So I'm really, really curious to see how it is after this length of time. I don't think physical fitness has that much to do with it as neurovestibular kinds of things." 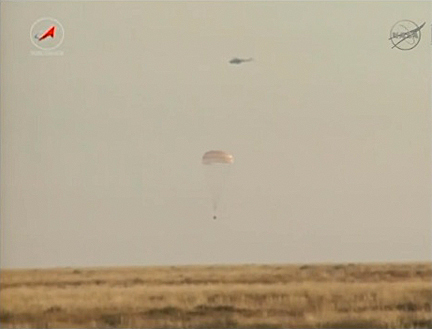 After the medical checks are complete, all three station fliers were to be flown by helicopter to nearby Karaganda. From there, Vinogradov and Misurkin planned to fly back to Star City near Moscow for debriefing while Cassidy was to board a NASA jet for a flight back to Houston. Cassidy said last week he was sad to leave the space station because "it's just so incredible and such an honor to be here." "But after five months, you feel ready. I'm excited to get home to see my friends and family and get back to just normal stuff. So it'll be a little of all those emotions." Asked what he was looking forward to the most after seeing his wife and three children, Cassidy said "a gooey, fresh-baked chocolate chip cookie ranks right on the top of my list." "What I will miss most up here is the international camaraderie that exists with a crew like this, sharing meals together, sharing fun days and hard days and cargo days, the whole experience with the international crews is just really neat." The trip home began when the Soyuz TMA-08M spacecraft undocked from the space station's Poisk module at 7:35 p.m. EDT Tuesday. After moving about 12 miles away from the lab complex, Vinogradov monitored a four-minute 46-second deorbit rocket firing starting at 10:05 p.m., slowing the spacecraft by about 286 mph to drop the far side of the orbit deep into Earth's atmosphere. After a half-hour free fall, the Soyuz TMA-08M's upper and lower compartments separated and the central crew module plunged back into the discernible atmosphere at an altitude of 86 miles around 10:35 p.m.
After enduring the extremes of atmospheric friction, two pilot chutes deployed, followed by the descent module's main braking parachute at an altitude of about 6.6 miles. The descent module then settled to a rocket-assisted touchdown at 10:58 p.m., closing out a mission spanning 70.4 million miles and 2,656 orbits over 166 days six hours and 14 minutes. During the course of their mission, Vinogradov logged one spacewalk and boosted his total time in space to 546 days over three flights. Misurkin, completing his first spaceflight, and Cassidy, completing his second, ventured outside three times each. During a July 16 spacewalk, Cassidy had to assist Italian astronaut Luca Parmitano when the latter's suit developed an internal leak, flooding the helmet with water. The spacewalk was terminated early and both men made it safely back inside. With the TMA-08M spacecraft's departure, the station is in the hands of Expedition 37 commander Fyodor Yurchikhin, Parmitano and NASA astronaut Karen Nyberg. Yurchikhin and his crewmates will have the lab complex to themselves until Sept. 26 when the Soyuz TMA-10M spacecraft arrives, bringing veteran Oleg Kotov, Sergey Ryazanskiy and Michael Hopkins -- both rookies -- to the station, boosting the crew back to six.